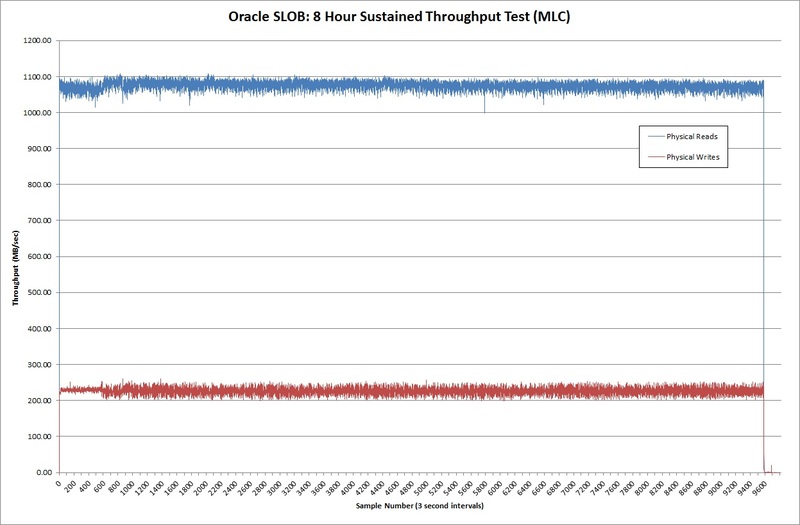 This is the final stage in the process of running a sustained throughput test. Having run the test successfully to completion, you now have a load of raw data in the SLOB directory… but what can you do with it? I have truncated the output after four rows of device information (sda, sdf, sdc and sde) because on my system there are 272 devices for every single iostat output. SLOB calls iostat with the options -xm 3 which means a full listing of those 272 devices will be written every three seconds. That’s 9,600 sets of information for each device – a lot of text! That’s all I need. You can obviously choose which columns you want, but for my requirement I only need the read and write throughput values. What you are looking for is sustained, predictable performance and no sudden drop-off in throughput as the storage system hits a wall. Of course you are also looking for reasonable throughput values, but that is highly dependent on your server infrastructure and storage networking as well as the storage itself….